Last weekend, we decided to take a much-needed “Family Trip” up to Westchester County in NY. There is so much to do in the Hudson Valley area, awesome Farmer’s Markets and amazing restaurants always top my list, however the highlight of the weekend was traveling to the “Stone Barns Center for Food and Agriculture” with the girls! We had the opportunity to take a family tour of the farm to see how they grow all of their vegetables and raise their animals in the most picturesque setting! What I loved the most is the fact that my girls were actually eating spinach and kale right from the garden. 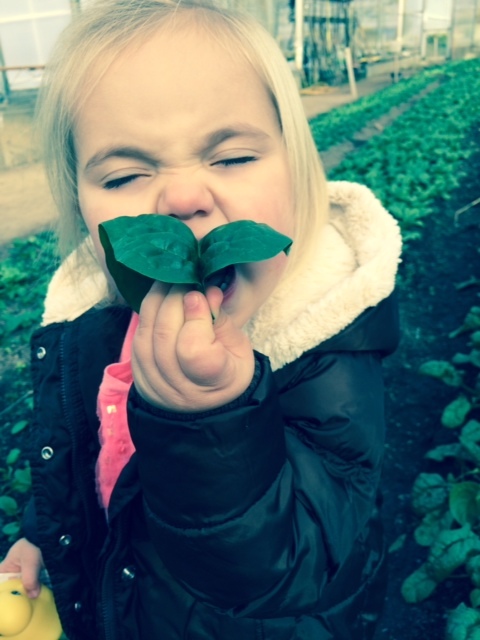 There is truly no better way to get your kids to eat healthy foods then to show them where they come from!! 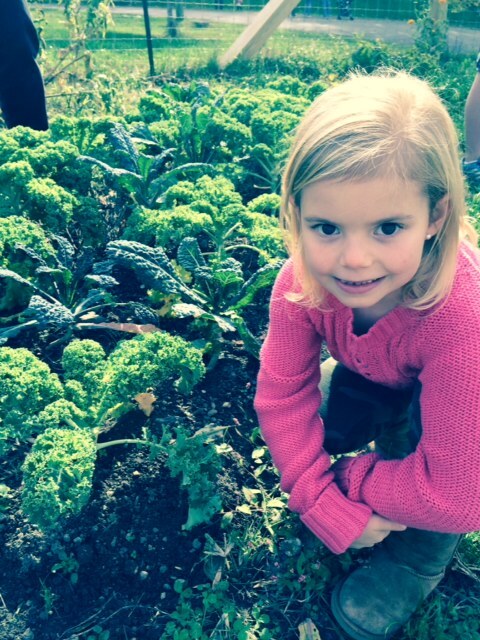 Gracie with the most AMAZING Kale! We came home on Sunday night after an amazing weekend together as a family and read our Daily Devotional as we sat down for dinner. The scripture was “Therefore I tell you, do not worry about your life, what you will eat; or about your body, what you will wear.” Luke 12:22 It was definitely God speaking to our entire family in that one moment, Gracie looked at me and smiled as a read this scripture. I started thinking how often do I worry about what to wear, how I look and even worrying about the foods that we eat as a family. Yes, we need to eat healthy and yes I want my kids to eat healthy, but my main goal in my life is to teach my children to lead their lives for God and in all that we do keep him the center of our priority and the rest will fall into place! It’s about finding that balance in your life with God at that center and I pray continually that in all that I do I don’t forget the one most important thing and that’s resting in the presence of the Lord each and every day and asking him to help me accomplish all of the things he has for me that day. Whether it’s getting to the gym at 5:30 am to meet my crazy cousin(Shannon) for a killer work-out, rushing the kids out the door for school and then putting a full day of work in, without him I will walk in the dark and when I’m with him, his light shines through me!!! I need this as a constant reminder that we get one life, one journey, all to share his glory, I pray that I continue to keep him my priority each and every day to make not just Fabulous Friday’s, but every day filled with his GRACE, LOVE and JOY!!!! Have a fabulous start to your weekend!!!! Roast 1 Whole Chicken – Drizzle the chicken with olive oil, season with salt and pepper before roasting and follow roasting instructions on the package. Chop up all of your veggies into a large bowl, toss with olive oil and season with salt and pepper. Halfway through roasting the chicken, throw all of your veggies in the bottom of the roasting pan around the chicken. We use sweet potatoes, radishes, carrots, green onions and Brussel sprouts, but you can add any others you like as well. Finish roasting your chicken the rest of the way. Once done, remove from the oven, squeeze with a fresh lemon and sprinkle with chopped fresh dill!! Simple, Fast and Delicious, especially this time of year!!!!!!! !